Participate in month-long events or host a special event to get students and families thinking about getting to school by walking, biking, or rolling! Our events can be seamlessly tied into the Manitoba curricula for science, social studies, physical education/health, and other subjects. For a list of curriculum ties by grade level, please refer to Chapter 6 of our Handbook & Resource Guide. As spring arrives in May, bikes emerge from basements and garages. Biking is a fun, fast, and healthy way to get to school, so let’s get kids riding! 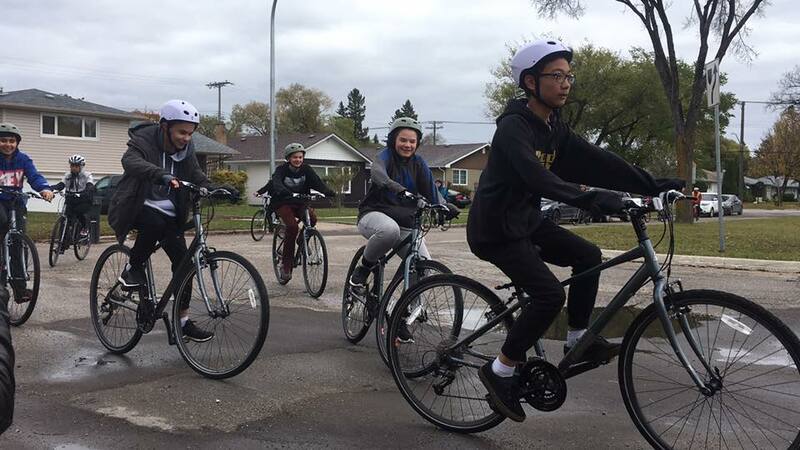 On Clean Air Day, we celebrate students’ achievements during Bike to School Month with fun outdoor activities. Walktober (formerly International Walk to School Month) takes place each October. Join thousands of schools around the world in promoting walking to school. Simple 30-second homeroom surveys give us powerful information about how Manitoba kids are getting to school! Green Action Centre thanks the Government of Manitoba, Department of Health, Seniors and Active Living for supporting our events.